The Stratolaunch — the world's largest plane by wingspan — took its first flight on Saturday above the Mojave Desert in California. 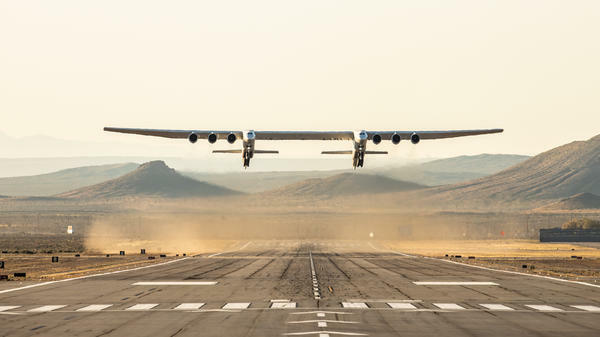 The world's largest plane by wingspan took its first flight on Saturday above the Mojave Desert in California. With a wingspan wider than the length of an American football field, the plane features six turbofan engines, a dual fuselage design and was made using parts from two Boeing jets, according to The New York Times. 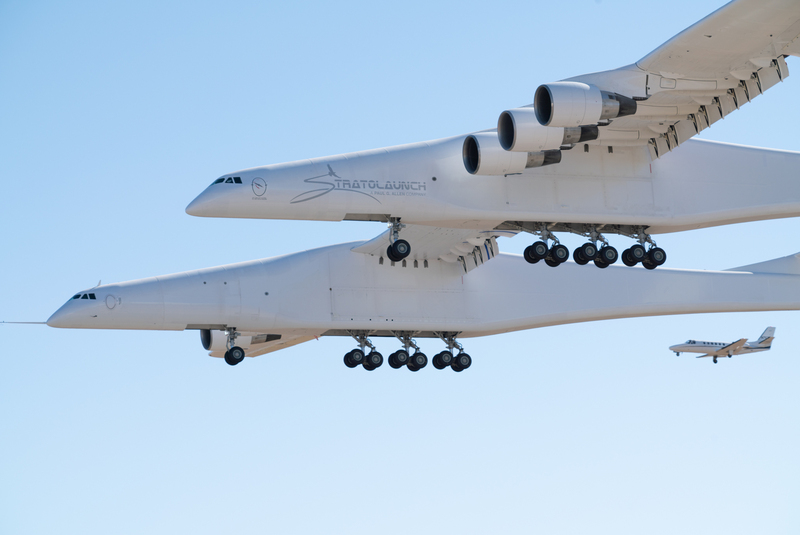 The Stratolaunch, as the plane is called, is designed to carry rockets to an altitude of 35,000 feet, at which time they would ignite and launch into orbit, according to The Verge. The rockets would carry commercial satellites into space. 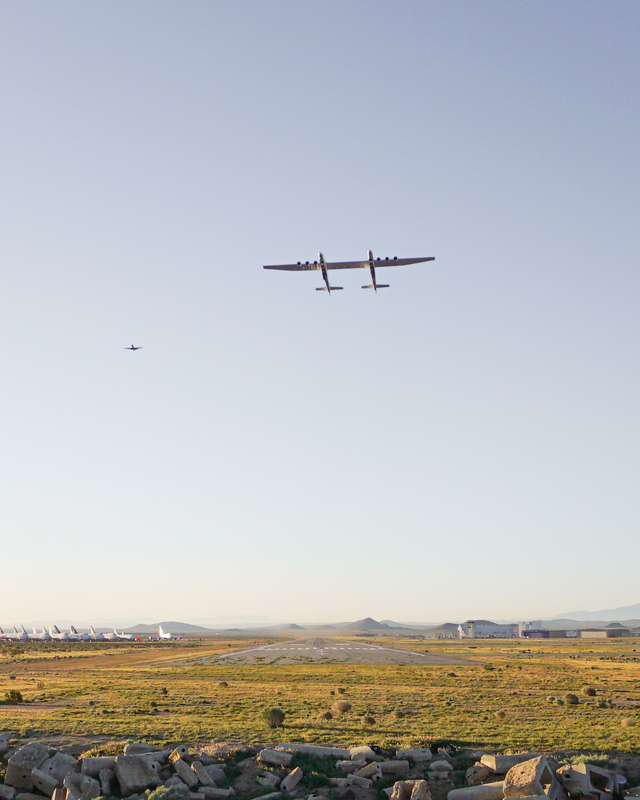 The plane was built by Scaled Composites, a partner of Stratolaunch Systems. Microsoft co-founder Paul Allen created Stratolaunch Systems in 2011. By launching rockets, satellites and other spacecraft from the sky, the company is betting it will be able to avoid the types of delays that ground launches are prone to, such as bad weather. The Stratolaunch plane features six turbofan engines and a dual-fuselage design. During the test flight that lasted more than two hours, the plane reached an altitude of 17,000 feet and a top speed of 189 mph, according to the company. "I'm really excited today to share that we have successfully flown the Stratolaunch aircraft for its first test flight this morning," Stratolaunch CEO Jean Floyd said during a press briefing. "It was an emotional moment for me to personally watch this majestic bird take flight and to see Paul Allen's dream come to life in front of my very eyes." Allen died in October. With a wingspan greater than the length of an American football field, the Stratolaunch successfully completed its first test flight Saturday morning. The company says it wants to begin launching rockets from the Stratolaunch by 2020 at the earliest, according to Reuters. But while it works toward that goal, it also faces competition from the likes of Elon Musk's SpaceX and the United Launch Alliance. Though the company isn't ready to launch anything just yet, Saturday's flight was considered a success by many, including test pilot Evan Thomas. "The flight itself was smooth, which is exactly what you want the first flight to be," Thomas said at the briefing. "And for the most part, the airplane flew as predicted, which is again exactly what we want." Said Thomas: "I honestly could not have hoped for more on a first flight, especially of an airplane of this complexity and this uniqueness." A previous version of this story incorrectly said the Stratolaunch plane was built by Stratolaunch Systems. The plane was built by Scaled Composites.